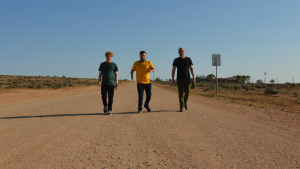 The award-winning gang from The Last Leg have been sent to the wilderness of Australia for the ultimate extreme road trip. They are guided through their adventures by Amar Latif, a charming and thrill seeking Scottish travel agent who also happens to be blind, and who decides to give them a difficult and dangerous road trip as far from their expectations as he can. The boys learn a great deal about the other side of Australia, a nation with a steadfast optimism and a dark underbelly. But the three find out a few things about each other too, whilst turning each encounter into an exciting, poignant and most of all, richly comedic journey. 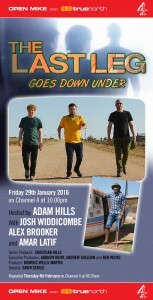 The Last Leg Goes Down Under first aired on Channel 4 in January 2016. It is a co-production with True North TV.